Kessler won the WBA regular title with an impressive stoppage of the tough, defending champion Brian Magee. The fight was off to a tense start where Kessler gained control and scored to the body while Magee pressed the action. Magee was out fast for the second and had Kessler under some pressure but Mikkel moved away and kept trying with stiff jabs to the body and a right - a difficult move against a southpaw opponent because while you can scor you can be caught as well. Kessler however landed a heavy right to solar plexus and Magee went down and was out but got up and held on and fought back until late in the round when heads clashed and then Kessler caught him again with a right to the body. Magee made it through the round but early in the third he was tagged again and went down and referee Luis Pabon waved it off so it goes as a tko. Regi was floored by a left hook downstairs 5 seconds into the fight and after two more knockdowns it was stopped.two more knockdowns later. Regi replaced Ferenc Hafner but it didn´t matter. Rudy vs inferior opponents spell ko! Skoglund scored with sharp, snappy jabs and then followed up with right hooks as Ainscough tried to tie him up but only got hold of one hand ... Ainscough floored twice in the second and a third time early in third for a stoppage. Skoglund looks sharp and is ready to step up in level of opponents. Boulden was stunned by a right hand, tried to retaliate and got tagged again and again until finally floored and was out but somehow got up and was stopped under protest - but he was out of it. Kakstys, too small, was down in the second and lost on scores of 40-34 twice and 40-33. Kakstys was a late sub for Dominik Ameri, who in turn subbed for A Gadajew. 40-36 on all cards with the bigger, better schooled Ceylan outboxing his wildswinging opponent. 40-35, 40-36 and 39-37. Smaadal punched a lot but wasn´t very effective and Kharkevich bled from the nose but covered up well. Hagen too eager and the rather inept Obeslo survived with ease. 39-36 twice and 38-37. Hagen had - correctly - a point deducted in the fourth for low blows. prodebut and Sauerland trial for Sturm, who was too big, willing and strong for Kugler. It was scored 40-36 on all cards. Jonak won on scores of 99-91, 98-90 and 99-90. Baghan walks into a left hook and goes down and out. 59-56 twice and 60-57 but apparently close enough for a draw. Left hook to the body ends matters. 99-90, 99-89 and 99-88, Williams down rounds three, four and eight. Settoul won the vacant EU title on scores of 115-113 twice and 116-112. Fadli won the French title on scores of 96-94 twice and 95-95. 57-56 and 58-57 for El Massoudi and 57-56 for Chiruta. Zenunaj won the vacant Belgian featherweight title. 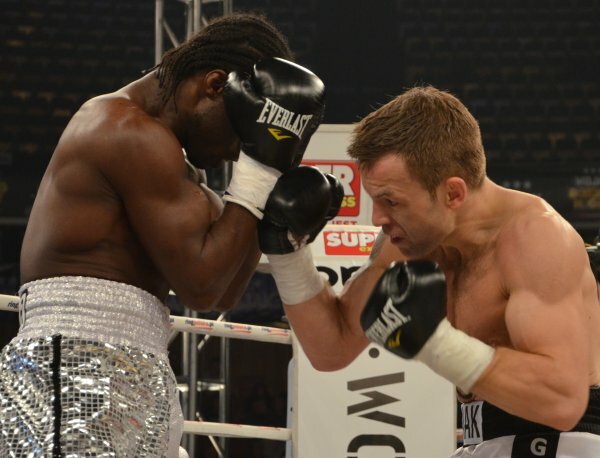 Bundu retained the EBU welter title with a surprising first round stoppage of El Massoudi. WBA flyweight title, 96-94 twice for Moreno and 97-93 for Kentikian. WBC Int´l title 126 lb title, 40-36x3.